Library of America, 2013. Hardcover. New. 8.52 x 5.33 cm. 2001-07-07. New. Ships with Tracking Number! INTERNATIONAL WORLDWIDE Shipping available. Buy with confidence, excellent customer service! Library of America. Hardcover. 1598532189 New Condition. . New. Library of America. Hardcover. 1598532189 Like New Condition. . Fine. 1980-04-01. New. Ships with Tracking Number! INTERNATIONAL WORLDWIDE Shipping available. Buy with confidence, excellent customer service! Library of America, 2001. Hardcover. New. 8.14 x 5.21 cm. Library of America. Hardcover. 1598532189 Special order direct from the distributor . New. Library of America. Hardcover. 1598532189 . New. Library of America. Hardcover. 1598532189 Remainder mark . Fine. Library of America. Hardcover. 1931082006 Please allow 4 - 14 business days for Standard shipping, within the US. Thank you for supporting our small, family-owned business! . New. 2001-09-10. First Edition. Library of America. Hardcover. 1598532189 *BRAND NEW* Ships Same Day or Next! . New. Library of America. Hardcover. 1598532189 *LIKE NEW* Ships Same Day or Next! . Fine. Avenel Books. Hardcover. 0517338416 New Condition. . New. Library of America. Hardcover. 1883011671 New Condition. . New. Library of America. Hardcover. 1931082006 New Condition *** Right Off the Shelf | Ships within 2 Business Days ~~~ Customer Service Is Our Top Priority! - Thank you for LOOKING :-) . New. Library of America. Hardcover. 1883011671 Like New Condition. . Fine. Library of America. Hardcover. 1598532189 BRAND NEW, GIFT QUALITY, DIRECT FROM THE PUBLISHER! NOT MARKED UP REMAINDERS OR DINGED AND DIRTY OVERSTOCKS! . New. Library of America. Hardcover. 1931082006 Special order direct from the distributor . New. Amaranth Press. Fine. 1986. First Edition. Hardcover. 0830004130 . This specific bonded leather hardback book is in fine condition with a hard board cover that has sharp edges and corners and has a tight binding. The pages are gilt on all sides and are clean, crisp, unmarked and uncreased . We package all books in custom cardboard book boxes and ship daily with tracking numbers. 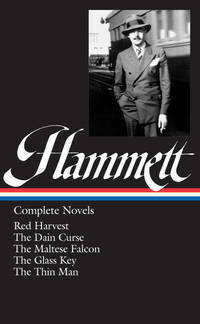 ; This volume contains Red Harvest, The Dain Curse, The Maltese Falcon, The Glass Key, and The Thin Man. ; 9.10 X 6.20 X 1.90 inches; 726 pages . 2001-07-07. Good. Ships with Tracking Number! INTERNATIONAL WORLDWIDE Shipping available. May not contain Access Codes or Supplements. May be ex-library. Shipping & Handling by region. Buy with confidence, excellent customer service! Library of America, 1999. Hard Cover. Collectible: Like New. Collector's edition. Like new hardback! Beatuiful tan cloth boards. In original cream-colored slipcase. No jacket, as issued. Publisher's insert loosely laid in. Appears unread. Text is clean, unmarked. Third Library of America printing. (Shelf location: D) All items carefully packed to avoid damage from moisture and rough handling. Tracking included. Library of America. Hardcover. 1931082006 . New. Library of America. Hardcover. 1931082006 Please allow 4 - 14 business days for Standard shipping, within the US. Thank you for supporting our small, family-owned business! . Fair. 2001-09-10. First Edition. Library of America. Hardcover. 1931082006 Remainder mark . Fine. Library of America, 2001-09-10. First Printing. Hardcover. Used:Good. Library of America. Hardcover. 1883011671 . Very Good. 1980-04-01. Good. Ships with Tracking Number! INTERNATIONAL WORLDWIDE Shipping available. May not contain Access Codes or Supplements. May be ex-library. Shipping & Handling by region. Buy with confidence, excellent customer service! Avenel Books. Hardcover. 0517338416 Like New Condition. . Fine. Minneapolis: Amaranth Press. Fine with No dust jacket as issued. 1986. Omnibus Edition. Bonded Leather. 0830004130 . International orders may require additional postage. ; Bonded brown leather with gilt titles and ornaments. Marbled endpapers. Raised spine ends. Gilt edges. Red Harvest; the Dain Curse; the Maltese Falcon; the Glass Key; the Thin Man; 726 pages . Library of America. Hardcover. 1931082006 *BRAND NEW* Ships Same Day or Next! . New. Library of America. Hardcover. 1931082006 *LIKE NEW* Ships Same Day or Next! . Fine. Library of America. Hardcover. 1931082006 New. Hardcover. Ivory-colored slipcase instead of jacket. For Additional Information or pictures, Please Inquire. . New. Library of America. Hardcover. 1883011671 . New. Library of America. Hardcover. 1883011671 Remainder mark . Fine. New York, New York: Avenel Books, 1980. 1st Edition 1st Printing. Hardcover. Very Good/Very Good. 8vo - over 7¾" - 9¾" tall. First Avenel Hardcover Edition (First Thus). With The Alpha Line Indicating A First Printing. The Book Is Bound In Brown Faux Leather With Gilt Stamped Lettering On The Spine. The Pages Have Tanned Due To Age And Paper Quality. The Jacket Has No Chips Or Tears. Random House Value Publishing, 1987. Hardcover. Good. Disclaimer:A copy that has been read, but remains in clean condition. All pages are intact, and the cover is intact. The spine may show signs of wear. Pages can include limited notes and highlighting, and the copy can include previous owner inscriptions. At ThriftBooks, our motto is: Read More, Spend Less.Shelf and handling wear to cover and binding, with general signs of previous use. Clean unmarked pages with good binding. Dust jacket in mylar. Secure packaging for safe delivery.Dust jacket quality is not guaranteed. Library of America, 2001-09-10. Hardcover. Good. Excellent customer service. Prompt Customer Service. Library of America. Hardcover. 1883011671 small dog ears - otherwise a fine clean unread copy with like new dust jacket - enjoy . Fine. Library of America. Used - Very Good. 2001. First Edition. Hardcover. Very Good. Library of America, 1999. Hardcover. Fine/Fine. 978 pages, including chronology and notes. 4th printing. Fine copy in a fine dust jacket in a mylar protector.